I followed the instructions here: with minor modifications to include opencv_contrib (I set the OPENCV_EXTRA_MODULES_PATH field to the path ~/opencv_contrib/modules). Before beginning, I used git to checkout the 3.2.0 tagged commit for each project, which I had cloned from github. I completed Step 16, but could not find the 'INSTALL' option for Step 17. Step 16 had several errors. See this screenshot: See also error code pasted below. 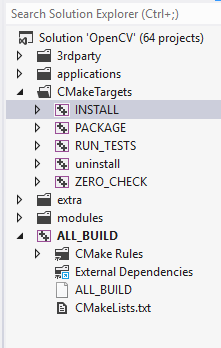 I did find an option CMakeTargets > INSTALL (see screenshot ), but it didn't seem to do anything? It looks like it just rebuilt the project. Much faster than the first time. I'm using Visual Studio 2012. Thanks in advance for any help!